We typically send our Mastering proofs electronically. You will download a special program to listen to your mastered tracks, burn a CD, or output WAV files when we are done. Of course, if you notice a problem or need to make a few changes let us know and we'll be happy to correct that. So, when everything is approved....when will you receive your final mastered tracks? Great news, you already have! The special DDP player you downloaded to listen to your mastered tracks IS your final copy of your mastered tracks, so keep it safe and backed up. 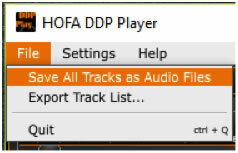 Any time you need to, you can open up the DDP player application and burn a CD of your mastered tracks by clicking the “Burn CD” button, as illustrated below. You can also output full resolution, uncompressed digital audio WAV files by selecting “Save All Tracks as Audio Files” from the “File” menu. These digital WAV files are great for sharing with your band mates or uploading to popular content sharing websites.